AUSTIN, Texas, Aug. 8, 2018 /PRNewswire/ -- International Biophysics Corporation, a 26-year-old global medical device manufacturer based in Austin, Texas, announced today the publication of a clinical study on the mode of action of High Frequency Chest Wall Oscillation (HFCWO) vests. The study, Effect of High Frequency Chest Wall Oscillation Vests on Spirometry Measurements, was published today in Respiratory Therapy's online issue and will be featured in the next print issue scheduled for October. In addition, the abstract of the study will be published in Pediatric Pulmonology. AffloVest Fully Mobile HFCWO Airway Clearance Therapy. HFCWO is a form of Airway Clearance Therapy for bronchial secretion clearance used in the treatment of Cystic Fibrosis, Bronchiectasis, Chronic Obstructive Pulmonary Disease (COPD), neuromuscular diseases and other disorders. It is estimated that over 5 million people in the United States may have Bronchiectasis. Although it has been asserted that vest-induced increased airflow bias in the lungs is one of the modes of action, the actual effect of HCFWO devices on cephalad airflow bias in the lungs during use has not previously been clinically evaluated. Thomas W. O'Brien, MD, Pulmonologist at Pulmonary Disease Specialists in Kissimmee, Florida and the study's Principal Investigator, explained its primary purpose. "It has been claimed that one of the operating principles of HFCWO vests is creating 'airflow bias' in the lungs, but valid clinical evidence supporting that claim is lacking. We aimed to prospectively evaluate lung function scores before, during and after use using different types of HFCWO vests to evaluate the claims of increased vest-induced airflow bias in the lungs." The prospective, single-center three-arm study enrolled 32 healthy subjects between February and March 2018. The trial was registered in ClinicalTrials.gov via the Protocol Registration System (PRS), completed under Institutional Review Board (IRB) approval, and published in Respiratory Therapy, the first study of its kind to measure airflow bias during use with HFCWO therapy. Each subject was assessed according to the American Thoracic Society's (ATS) guidelines for baseline lung function parameters. Included in these parameters are Forced Vital Capacity (FVC), Forced Expiratory Volume (FEV1), Peak Expiratory Flow (PEF), Tidal Volume (TV), and Forced Expiratory Flow (FEF25%-75%). Each subject was fitted with two different types of HFCWO vests. 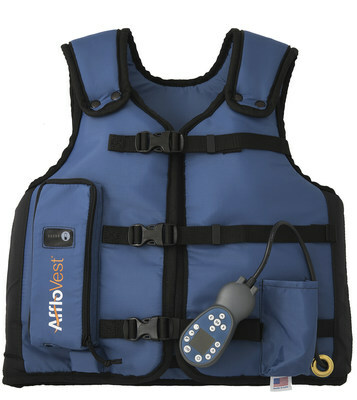 One type was International Biophysics' AffloVest® mechanical oscillator-based device, and the other type was one of three compressor-based "air bladder" oscillatory devices (The Vest®, SmartVest®, inCourage®). Lung function tests were then performed on each subject, comparing each subject's baseline pulmonary lung function values without a vest to the values observed during and after use of an HFCWO vest. Continued Dr. O'Brien, "Vibratory action through the chest wall helps to loosen secretions, much like manual Chest Physical Therapy (CPT). This study was designed to investigate the effects of the application of mechanical oscillatory and compressor-based HFCWO vests during use on standard spirometry parameters. The results are very interesting and clinically relevant." The study also found for the first time that the application of compressor-based HFCWO vests led to a significant decrease in FVC, FEV1 and FEF25-75% from baseline during use. In addition, the standard spirometry measurements collected in this study show no increase in PEF in any of the HFCWO vest groups and thus do not support the concept of HFCWO vest-induced cephalad airflow bias in the lungs as an operating principle of HFCWO vest therapy. Although both groups showed a decline in FEF25-75%, the compressor style group decrease in FEF25-75% was 3 times that of the AffloVest®. Lung function measurements returned to baseline after discontinuation of use for both types of HFCWO devices. David Shockley, International Biophysics' President and CEO, concluded, "This clinical study challenges the long-held belief that HFCWO vest-induced cephalad airflow bias correlates to effective airway clearance therapy. Manual Chest Physical Therapy (CPT) has always been considered the gold standard in mobilizing and clearing lung secretions. We engineered and developed the AffloVest to mimic hand CPT using our patented Direct Dynamic Oscillation™ technology that also provides the benefit of mobility and portability during use for the user." The company has a strong 26-year history of developing and launching innovative and disruptive technologies. The company is focused on offering patients better outcomes through improved treatment therapies. Centered on a precision ISO 13485 certified, FDA registered, state of the art manufacturing facility in Austin, Texas, International Biophysics continues to research and develop advanced solutions for physicians and patients.